With the release of our latest ScanLife app, you can help the ScanLife community discover the very best by liking the items you scan. Plus, you can save all of your favorites to your Facebook page for later. To get you all in the social holiday spirit, we bring to you the ‘Like it to Win’ Holiday Giveaway, a simple way to win big during the shopping season. 3) You’re now automatically entered to win! We will give away a $50 Amazon gift card every day, plus a $500 Grand Prize. The more you scan, the better chance you have to win! Stay tuned for more winners – it could be you! The contest starts on Tuesday, November 20th and is scheduled to end December 3rd at Midnight EST. You may enter as often as you would like, the more items you like, the better chance you have to win. The giveaway is open to anyone in the world who is over the age of 18. You must connect to your Facebook account from the ScanLife app for your likes to be counted. This can be done from Settings or More. If you are selected winner, you will be sent an email with details on how to claim your gift card. You must respond within 48 hours to claim your prize. Scanbuy will not use or share, with a third party, any information collected for direct marketing purposes. We respect the privacy rights of individuals. Scanbuy employees and friends/family of employees are not eligible. 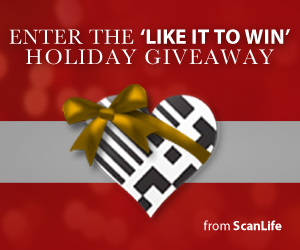 2 Responses for "Scan It, Like It & Win this Holiday Season"
Great way to share what you love with who you love. Exactly Steven! We hope you’re out there scanning – who knows, you could be our next winner!